I just thought i would kind of do a self promo because i haven’t posted about my products for a while! So, Im kind of a hippie at heart, and so this sometimes reflects in the products i make. I have a few items in my shop that are ‘boho’ and ‘hippie’ that i wanted to tell you guys about! First are my Patchwork Curtains – They are made from fabric I’ve sourced from literally everywhere, i try to good quality fabrics that normally have a pretty pattern and can do any size thats needed. Ive made a lot of curtains now, all have been individual and one of a kind which is what i love about them. These are the ones i used to have in my own flat, i used quite a few vintage scarfs in this one but they are always lined so light doesn’t flood through. I also have some lovely boho cushions available in lots of different colours/materials! Each one is one of a kind so YOU get to pick what you like and i will do my best to acocomodate. I have lots of lovely bunting available also, which would look fab in a hippie style room. Here are some other things I really really want in my own home from sites on the internet and also what I have found on the amazing Internet which i will keep adding too!! Isnt this wonderful?! I would definitely get this… although i haven’t got enough room on my walls as i have covered them with pictures!! But it is only 12.00 which is a bargain. dream catcher – gorgeous dream catcher from someone n Etsy. I really advocate etsy, people work so hard on there and i dont think others realise how hard it is to get your shop noticed and get sales. Another gorgeous boho etsy shop that sells glass! how brave!! I love these, i have lots in my house ranging from candle holders, hanging domes, they just look gorgeous and are very popular at the moment! Visited the Louvre again, this time getting the floor plan and actually spending time going round each bit which was definitely worth it. Saw the Mona Lisa again, but once again it was packed and i just couldn’t really get that close which was disappointing. But i did see Leonardos other paintings which were amazing. Went on a fabulous ride in a mini fair that was happening in the Jardin des Tuileries. I had so much fun it was a large swing that went really high so i got a couple of good photos of the Eiffel Tower! Visited Moulin Rouge building and took a lot of photos, wasn’t too impressed tbh.. I thought it would have looked better then it did. Saw the Arc de Triomphe! Gorgeous and definitely worth a look. i took some really pretty pictures as well. Sat and read in both the Parc Monceau and Champ de Mars gardens – currently reading Wild by Cheryl Strayed (definitely recommend). So. here it is my first travel blog entry. Over this year I made a resolution to myself to be more flexible… to explore new things and not just live my life based on societies and my own rule book. I can’t work a mundane job… I have to be flexible and work around my own routines that I have. So, this year I’ve managed to go to Thailand (very short and abit disastrous but I won’t go into that), Las Palma which was fantastic with my sister Amy. Bergerac in South of France for two-week cat sitting where I had use of a car (which really helped). And not I am in Paris for two weeks, then flying to Madrid after that for two weeks. So overall compared to the last few years of my life it has been brilliant. I struggle with the language difference and I feel very arrogant because I can’t speak another language. But I may take some classes in either French or Spanish. So, I know this blog is mainly crafts related but I’m think of diversifying it a little bit and adding in a few more sections. Ive been searching the internet for a while now for new craft ideas, tutorials, inspirational images to gather information for my upcoming projects that i have in mind. Then i thought… i am going to write about my findings on my blog! That way i can keep a log on what i find and so can refer back over time. Good Idea?? Yup. Welcome to the world of a bob haired little girl called Belle and her adorable bunny friend Boo – a charming world of innocence, warmth and adventure. 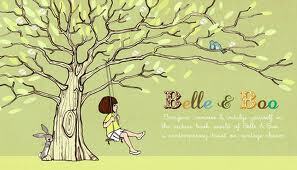 Belle and Boo is a British lifestyle brand known for original, nostalgic ‘story book’ illustrations of children. The collection includes gift items, books, framed artworks, stationery, home wares and a beautiful collection of girls’ clothing. A wonderful website and book. Lots of cute illustrations for children and adults!! Very inspirational indeed!! I have been making Loads of cards lately 🙂 I think im obsessed, if you share my obsession please post your links to your handmade cards here!! I would love to see them and get some inspiration. So paste your links here!! you can see my range of cards on my website.